The LED light therapy has recently become very popular in the beauty industry, and people wonder if the LED light therapy can really help improve the skin, and the answer is YES. LED means Light Emitting Diode therapy, and as a matter of fact, it has been around for decades, because NASA used the technology in their plant growth experiments on board the Space Shuttle in the '80s. Not long ago they found this technology useful in the beauty industry to treat everything from severe acne to fine lines and wrinkles because it's relaxing and also very therapeutic. And it all seems too good to be true doesn't it? Because you shine an LED light on your face and your problems go away? Well, it's because there’s a powerful source of energy in those tiny little lights, and there’s a lot more going on below the surface of the skin that only science can explain. 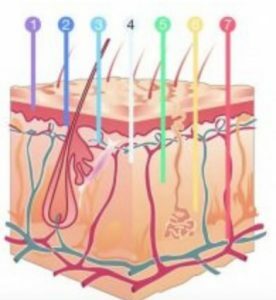 Light waves are measured in nanometers and there are 10 million nanometers in one centimeter, so when we talk about therapeutic light penetrating the body, it only affects the skin which is our largest and outermost organ. LED facial treatment is also known as Colour Light Therapy. Our machine uses seven different clinically proven wavelengths of LED lights, because each LED colour penetrates your skin at different depths and cause various reactions in your skin. So it can fight acne-causing bacteria, and with regular use will even kill this bacteria, and will plump up the skin, reduce wrinkles and stimulate the natural production of collagen, and this can result in skin rejuvenation, tissue repair, and promotion of wound healing. Because the wavelength spectrum can penetrate light waves deep into the skin it can trigger a natural intracellular reactions, and depending on the light, everybody's skin is going to respond differently, but the benefits of LED treatments are cumulative so you will see results over time. What Do The Different Colours Do? The yellow or Amber light wave helps with melasma, and spider veins and redness and promotes lymphatic drainage. The red infrared light reduces the appearance of fine lines and wrinkles, and stimulates the collagen production. 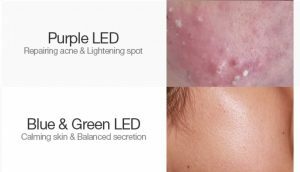 The purple light is anti-inflammatory and is used with the red together for healing acne and skin rejuvenation. The blue light stimulates the production of oxygen, and kills the acne-causing bacteria without damaging the skin and is used for blackheads and whiteheads. The green light is soothing and is used for anti-aging and hyper-pigmentation and inflammatory because it speeds up healing. The white laser light penetrates the deepest into the skin and works to tighten the skin and reduce inflammation. Accelerates tissue metabolism and decomposition of brown spots. It Sounds Like Magic, but there are a lot of studies that back it all up. So Who Is a Good Candidate For an LED Treatment? People who are concerned about aging, or want to prevent fine lines and wrinkles, and anyone with sagging wrinkled skin, and anyone with acne or breakouts, and chronic inflammation, and skin discolouration. Celebrities like Kourtney Kardashian and Jessica Alba amongst many others are all in favour of LED light therapy because it is a great choice for anyone who prefers non-invasive skin tightening treatments. It feels totally relaxing and therapeutic because the LED lights feel warm on the face, but will not cause burns to the skin, but protective goggles must be worn because the lights are very bright. Because specific medications or conditions can cause a person to develop sensitivity to light or even have a seizure, and herbs and over the counter medications such as Psoralen and St. John’s Wort can also cause a sensitivity to light. Check with your doctor before booking an appointment. Not possible if you have epilepsy, or f you have an open wound or an active skin infection, or if you are currently on any photosensitive drugs, or if you are currently taking cortisone injections or any other kind of steroid injection(s). And it's not an option if you are pregnant or breast feeding. And you should always ask your doctor how long you should wait before you can have an LED light therapy treatment. 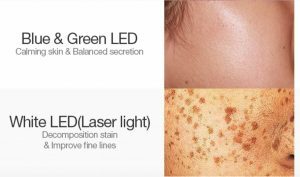 How to Book an LED Light Therapy Treatment? The best results are achieved when combining it with a facial, because we can treat fine lines and wrinkles, and stimulates the natural collagen production, and acne and inflammation, and it is a good choice because it builds collagen and is making the skin healthier in general. 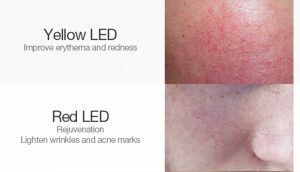 For that reason the LED light therapy is used as an add-on to a facial or a peel, and to achieve the best results we recommend a series of six Quick Beauty facial treatments with the LED light therapy add-on, and if you are not pressed for time you can add it on to any other facial of your choice. Can You Use an LED Light At Home? Yes, and if you actually use it, it'll be better than doing nothing for your skin at all and it's pain free and doesn't cause any damage. There are certainly very futuristic masks and gadgets on the market, but the devices you use at home don't have the same strength as professionals use. So in my experience, I find people often have the best intentions and plan on using it daily, but then life gets in the way and the good intentions fall by the wayside, so the gadget just sits in the closet collecting dust. So you are better off to just book a facial with an LED light therapy add on and let a professional pamper your skin.